Even though last year became the Year of Dissertation rather than the Year of Chocolate, I did get some good chocolate stuff done at the beginning. These Easter eggs were my favorite. 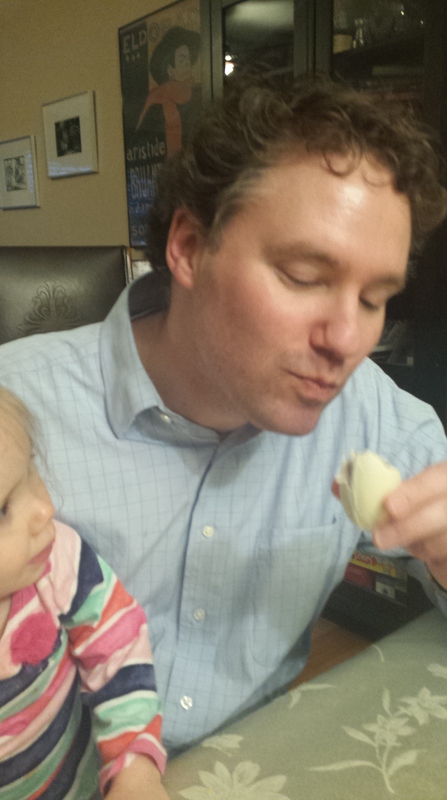 My husband can’t eat chocolate – it’s a migraine trigger. White chocolate is okay, so usually I can get him something else to substitute whenever I make chocolate treats. Cadbury Creme Eggs have always been a glaring exception, though, as they are exclusively milk chocolate. But he loves them. I decided it was time to attack the problem and practice tempering chocolate at the same time. 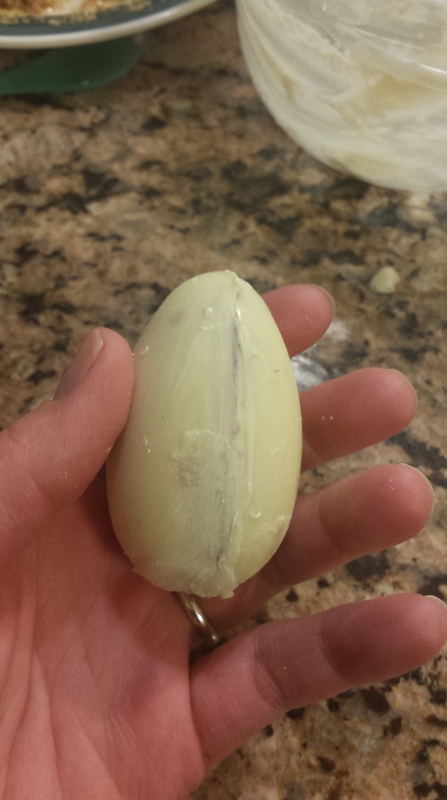 I figured I’d make some white chocolate shells, open up a regular Cadbury egg, scoop out the filling, and swap it into the new shell. Of course out of curiosity I asked the Internet what the filling is made of first, and after wading through some conspiracy theories about whether Cadbury has recently changed (for the worse) its filling, I figured out it’s just fondant thinned with simple syrup. My homemade fondant is really good, and I happened to have some leftover from an earlier cake, along with some vanilla bourbon simple syrup from another cake. (Note: If I ever invite you over because I’m cleaning out my fridge, take me up on it. The chore 100% of the time involves frosting.) So I decided to spare the pre-made filling and make my own. The only problem was that the fondant was already colored blue and red. Neither seemed right, until I remembered that blue + red = purple. Go ‘Cats. Then I needed some kind of mold. 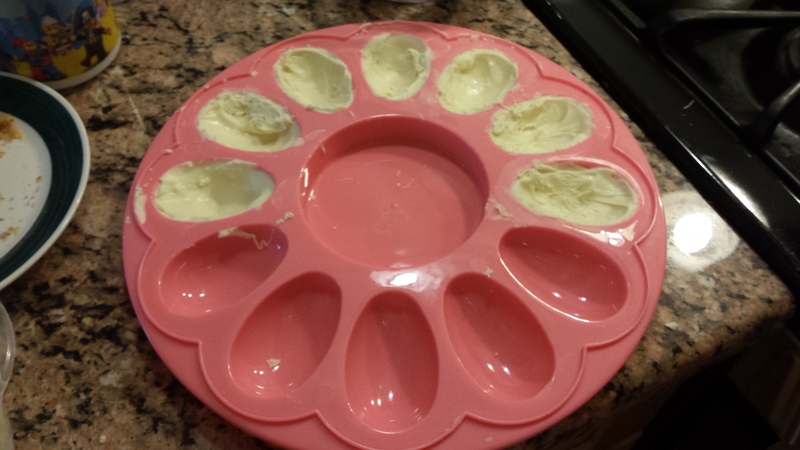 Most candy molds are meant for solid candy melt pops, so I had to look elsewhere, which meant wandering through the seasonal section at Target until I stumbled on the perfect solution: an egg tray. Trial and error taught me that it takes about 1/2 oz of chocolate per half shell, and trying to do more than 6 or 7 at a time (half the tray) gets dicey. The chocolate cools too quickly, and I was likely to spill one while fixing another. I put a dollop of melted (and tempered) chocolate into each section of the tray and used a spoon to spread it up the sides. I had to make sure it got all the way too the top so the seams would fit together. The unanticipated benefit of the tray being pink is that it’s pretty easy to tell where the chocolate is too thin, but I also wanted to make sure it wasn’t so thick it would be hard to bite. A couple minutes in the fridge firmed up the shells, and then they popped out really easily. To make sure two halves fit together I melted the edges by pressing them against a warm griddle for a couple seconds. Then I piled the purple fondant into one half, re-melted the second half, and used a little of the melted chocolate as glue to make sure they stuck together. They were awesome, and appreciated. 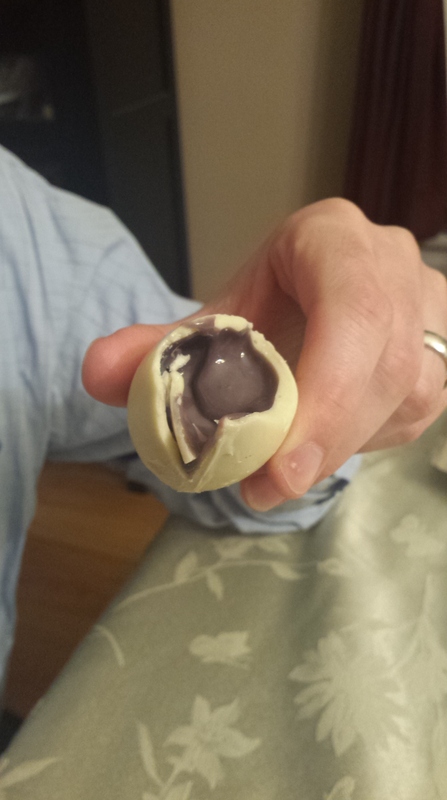 While this project was inspired by my husband’s desire for a white chocolate Cadbury egg, I couldn’t let him have all the fun. 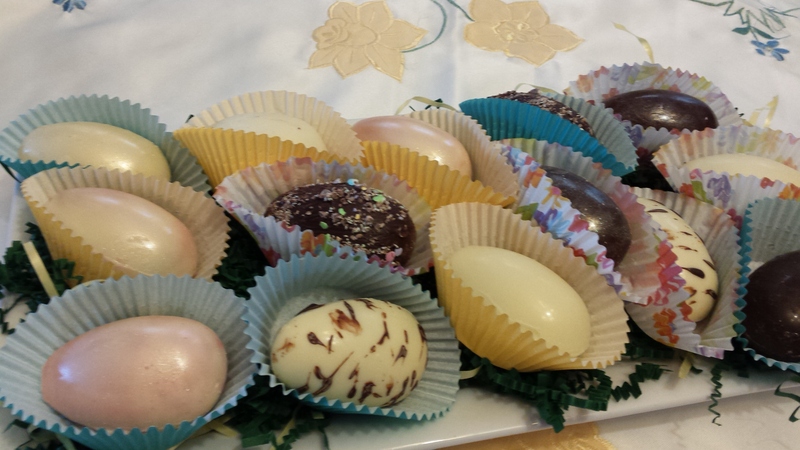 I made some dark chocolate eggs too, and I played around with the fillings. 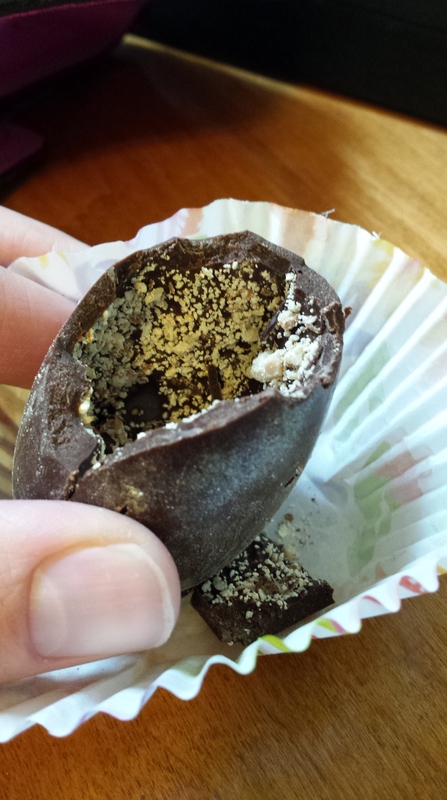 In some I put crushed almonds or M&M’s into the shells before they hardened. Others got Nutella. Still others got blackberry ganache (a recipe I have since lost, sadly. But it was epic.) I applied pink and gold pearl dust to the ganache and almond eggs, respectively, to distinguish them, and sprinkled some M&M dust (glued on with melted chocolate) to the M&M eggs, and drizzled Nutella on the Nutella-filled eggs. 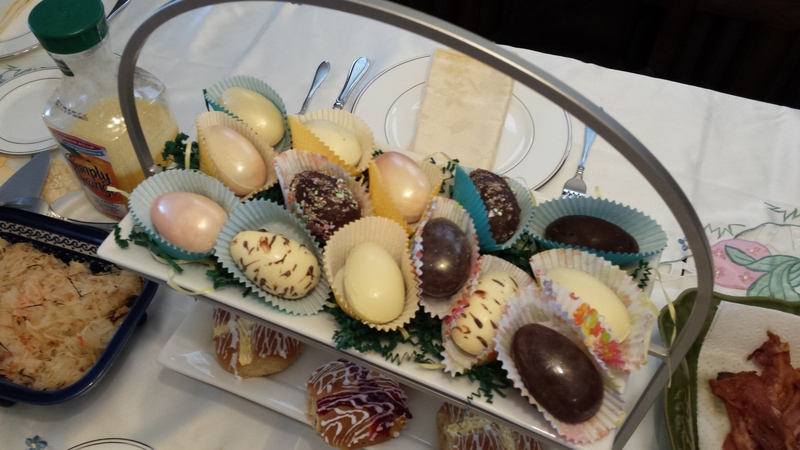 For how gorgeous they turned out, they were a relatively easy addition to my Easter brunch.